Since 1991, Capcom (Street Fighter, Darkstalkers) and SNK (Fatal Fury, King of Fighters) compete for the title of "the best fighting games creator". 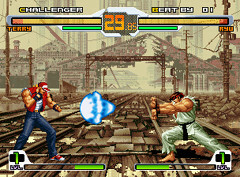 Towards the ends of the nineties, an agreement is signed between Capcom and SNK to organize a challenge between both universes, each publisher having to make their own version of the game. In 2000, Capcom releases his version: "Capcom vs SNK" on Naomi, followed by Capcom vs SNK Pro and Capcom vs SNK 2 on Naomi GD-ROM, these games are a huge success. Meanwhile, SNK begins the development of "SNK vs Capcom" but go brankrupt in 2001. The ex-CEO of SNK starts up Playmore and buys back intellectual properties of SNK. We'll have to wait until 2003 to see the release of SNK vs Capcom; the "made in SNK" version of the game running on their own hardware, the Neo-Geo MVS. Result: 32 fighters (some of them are hidden) coming from Street Fighter, Darkstalkers, King of Fighters, Samurai Shodown, ... Capcom characters have been redesigned by SNK artists giving them a welcomed new look. The "oldschool" feeling (that is not present in Capcom versions) that emanates from this game will please old fighting games nostalgic players (and there are more than you might think). 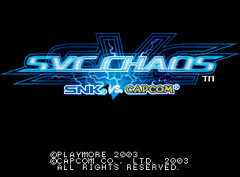 The "chaos" themed backgrounds give SVC a unique atmosphere. We can just regret that Capcom fighters are weaker than SNK ones (what a surprise) and that sprite collisions detection is not so good but nothing disatrous. This game will please many players (and many operators too)!